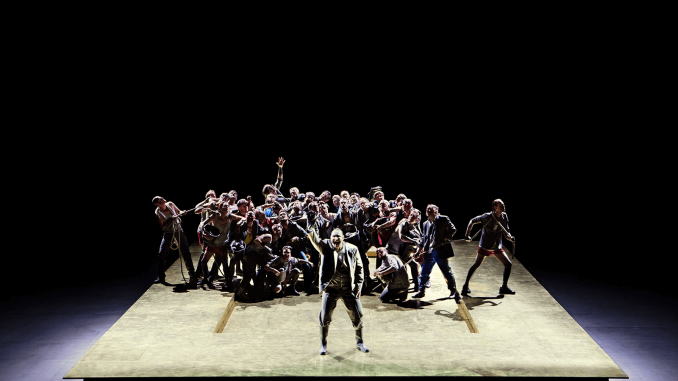 In her newest production of der Fliegende Holländer at Opera Vlaanderen, director Tatjana Gürbaca impressively explores the dark sides of greed and the excesses of capitalism. This interpretation is presented on stage very grippingly – especialy thanks to the incredibly convincing acting by cast and chorus. Gürbaca’s interpretation stems from a rather poignant scene in Wagner’s opera: when the sailor-merchant Daland first meets the strange and peculiar Dutchman, the two get down to business directly. The cursed Holländer immediately inquires whether Daland happens to have a daughter of marriageable age. Daland’s interest is piqued by the riches that the Dutchman offers in exchange of a wife, and the two quickly strike a deal: Daland’s daughter Senta is essentially sold off to the Dutchman. Taking her cue from such transactions, Gürbaca sets the opera in a rather bleak universe – an industrial capitalist society that exploits the world’s resources and riches in its insatiable desire for profit and wealth. In this world, true love does not seem to exist. Rather, relationships are business deals that profit both parties. Gürbaca sees the Holländer as the first capitalist – the man who first started exploring the world in an insatiable desire for riches and wealth. Once cursed, he learns that riches and wealth do not provide happiness. Nevertheless, it is the only attitude that he knows. In a way, he has been irrevocably tainted. The only character untainted by a world obsessed with material gain is Erik, Senta’s hunter-lover. In Gürbaca’s production, he is the only character who is not interested in money and material gain. Rather, he represents a pre-industrial alternative to the crazed and self-destructive capitalism that Gürbaca presents. Gürbaca stages her ideas about der Fliegende Holländer convincingly and impressively. The Steuermann, for instance, when he sings about his girlfriend back home, he never takes his eyes off the banknote in his hands. Likewise, when Senta and the Holländer meet for the first time, they start to undress while facing each other. It seems as though they want to inspect the ‘goods’ prior to committing fully to the business agreement that their relationship seems to be. Sets and props also match Gürbaca’s concept very well: most characters and members of the chorus fiddle around with pieces of coal, banknotes and a substance that resembles oil. The minimalist set – featuring two vertical pillars that called the Trump tower to mind – was entirely golden-hued. 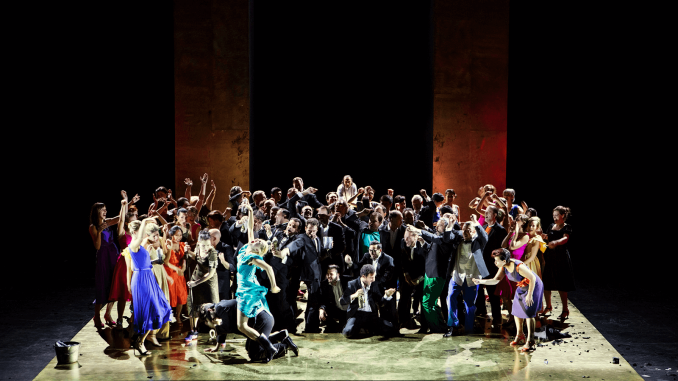 Opera Vlaanderen’s run of der fliegende Holländer was far from a smooth operation, due to the flu season. At the performance I attended, the role of the Holländer was not sung by the originally scheduled Iain Paterson, but by Markus Marquardt, who stepped in for Paterson. Marquardt sang the role with a steady voice and acted convincingly, thereby blending into Gürbaca’s production almost seamlessly. As Senta, Liene Kinča sang with a powerful, impressive voice. Her high notes, however, tended to sound somewhat sharp and not entirely pleasant. Her excellent acting, however, more than made up for this relatively minor shortcoming. The Czech tenor Ladislav Elgr sang Erik with a nice and, at times, lovely mellifluous voice, which fit magnificently with Gürbaca’s take on his character. The most impressive singing came from Dmitry Ulyanov as Daland, who was perfectly cast. Not only did he provide seemingly effortless, sonorous singing, he also acted the part of the unscrupulous, money-obsessed business man to perfection. The chorus of Opera Vlaanderen played an important part in the success of this production: their voices blended together to one impressive whole, while every single chorus member spine-chillingly presented individuals crazed by their shared obsession with profit. Up-and-coming conductor Cornelius Meister drew wonderful colours and effects from the orchestra. Wagner’s music sounded movingly tender or, alternatively, overwhelmingly violent at all the right moments.